The A-B-C-D method to applying the Framework for Strategic Sustainable Development consists of four steps which are repeated as an organisation progresses toward sustainability. This method as others used by The Natural Step practitioners is based on backcasting from sustainability principles. This first step aligns the organisation around a common understanding of sustainability and identifies a 'whole-systems' context for that organisation; building a common language around sustainability as well as creating a vision of what that organisation would look like in a sustainable future. The Natural Step principles of sustainability, basic science and whole-systems approach are presented to develop strategies for living in balance with nature and our global community. Participants review details of the state of the earth's systems, including the ecological, social and economic trends that are undermining our ability to create and manage healthy and prosperous ecosystems, businesses and communities. During the visioning process, people are encouraged to set ambitious goals which may require radical changes in how the organization operates. Some goals may take many years to achieve. This is where businesses often begin to identify the service they provide independent of any one product (for example, providing energy services versus oil). Incorporating this awareness into the visioning process unleashes innovation and releases the company from preconceived limitations. This step uses the four sustainability principles to conduct a sustainability ‘gap analysis’ of the major flows and impacts of the organisation to see how its activities are running counter to sustainability principles. The analysis includes an evaluation of products and services, energy, capital and human resources from 'cradle to cradle'. The assessment also looks at the social context and organisational culture in order to understand how to positively introduce change. This allows the organisation to identify critical sustainability issues, their business implications, any assets they may have and opportunities for change. In this step, people are asked to brainstorm potential solutions to the issues highlighted in the baseline analysis without any constraints. Armed with their vision of success and potential actions, organisations look backwards from the vision to develop strategies toward sustainability. This is called backcasting and it prevents people from developing strategies that just solve the problems of today. Instead, they begin with the end in mind, moving towards a shared vision of sustainability, with each action providing a platform for further improvement. After identifying the opportunities and potential solutions in the ‘C’ step, the group prioritises the measures that move the organisation toward sustainability fastest, while optimising flexibility as well as maximising social, ecological and economic returns. This step supports effective, step-by-step implementation and action planning. At this stage, organisations can pick the 'low-hanging fruit' - actions that are fairly easy to implement and offer a rapid return on investment in order to build internal support and excitement for the planning process. 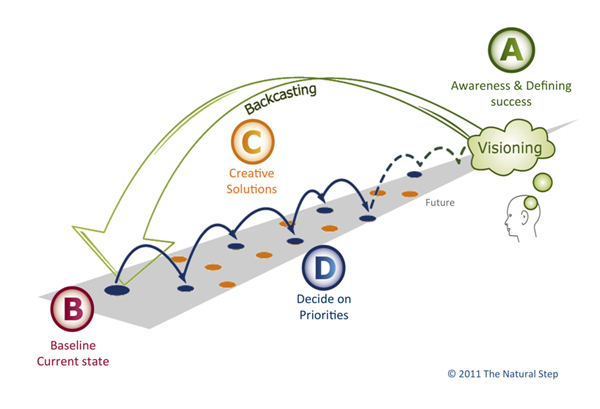 Backcasting is used to continually assess decisions and actions to see whether they are moving the organisation toward the desired outcome identified in ‘A' step (awareness and visioning). Sustainability principles provide new design parameters that drive product and process innovation throughout the system. This step also incorporates organisational learning and change methods, essential elements to move people into new ways of thinking and working together. The sustainability principles help people stay on course as they process the myriad of information and decisions involved in long-term planning. What’s considered realistic today never determines the direction of change, only its pace. This approach is based on systems thinking, setting ambitious goals, and developing realistic strategies to achieve them. Organisations are not expected to achieve long-term goals immediately. They’re encouraged to move systematically by making investments that will provide benefits in the short-term, while also retaining a long-term perspective. They use the Framework for Strategic Sustainable Development to map-out a series of steps that will eventually lead to sustainability.